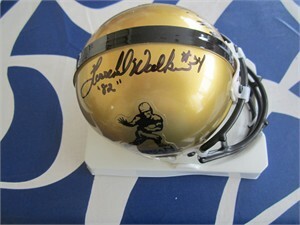 Rare Heisman Trophy logo Riddell authentic mini helmet with metal facemask autographed in black marker by Herschel Walker, Joe Bellino and Billy Cannon. From a paid signing with TriStar, with their numbered hologram on the helmet and certificate of authenticity from AutographsForSale.com. ONLY ONE AVAILABLE FOR SALE.